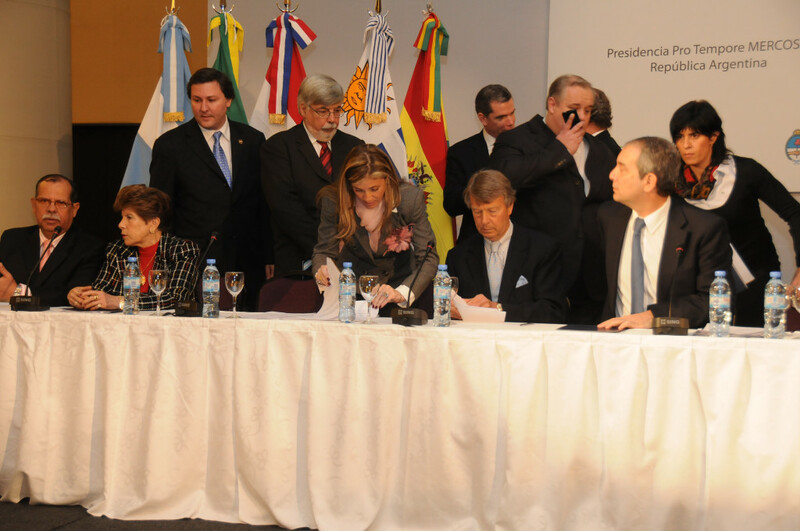 In the context of implementing the strategic aim of the Hague Conference of reinforcing its co-operation with, and its presence in, Latin America, the Secretary General, on 7 May 2010, signed two agreements in Buenos Aires. The first agreement concerns co-operation with Mercosur and was co-signed by the Ministers of Justice of the Members of Mercosur (Argentina, Brazil, Paraguay and Uruguay), as well as those of its Associate States (Bolivia, Chile, Ecuador and Peru). The agreement entered into force immediately. The second is an agreement with the Government of Argentina, which clarifies and reinforces the position of the Liaison Legal Officer for Latin America and his office. This agreement is subject to approval by the Parliament of Argentina. On the occasion of the signing ceremonies in Buenos Aires, the Secretary General and the Liaison Legal Officer also paid a visit to Montevideo where they met with the Vice-Minister of Foreign Affairs of Uruguay, H.E. Roberto Conde, with Dolores Aguilar, Director of the Instituto Interamericano del Niño, and with Augustín Colombo Sierra, Director of the Secretariat of Mercosur, both of which are established in Montevideo.